It is estimated that in excess of 18 million adults in America have obstructive sleep apnea syndrome or OSAS, a disorder in which the individual has one or more pauses in breathing or shallow breaths while they sleep. These pauses can last anywhere from a few seconds to minutes and can happen multiple times during the night. One of the most common treatments for sleep apnea is a CPAP or Continuous Positive Airway Pressure machine. There are both pros and cons for using CPAP machines for sleep apnea and patients must carefully consider them before embarking on this treatment option. Though it helps with sleep quality, many find the CPAP machine hard to get used to when finding a comfortable sleep position. A common symptom of sleep apnea is excessive sleepiness during the day, which may result in nodding off, sometimes at inopportune moments. This is most likely due to the fact that the sleep is interrupted so often and deep sleep is difficult to obtain. 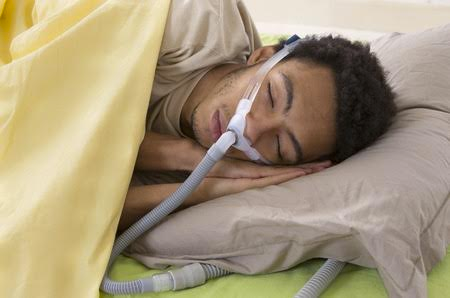 CPAP machines keep the airway open during sleep by applying pressure with a continuous flow of air that is delivered through a mask and tubes. With regular use, patients report that they not only fall asleep faster, but stay asleep through the night and get better quality sleep. Another common symptom that people with sleep apnea experience is loud, disruptive snoring. Although the person that snores is rarely bothered by it, their bed partner and other household members may find it difficult, if not impossible to sleep through the noise. Most people that use a CPAP machine say that they hear fewer complaints from their spouse about their snoring during the night. Therefore, the machine does double-duty by benefiting the user directly and his or her bed partner indirectly. Both parties are able to get a better night’s sleep, which reduces stress. Heavy snoring, followed by periods of not breathing, according to researchers, causes increases in blood pressure. This is a serious health condition that can lead to other complications such as heart attack and even stroke, if left untreated. In one study, involving 318 patients with moderately severe apnea, researchers concluded that CPAP use is an effective way to lower blood pressure. This was the case for all patients, including those that had their blood pressure under control to begin with. Many patients have a difficult time adjusting when they first start using a CPAP. For some, it is difficult to fall asleep because they feel a bit claustrophobic with the mask on. For others, the mask and straps are so uncomfortable, they take it off during the night. Others complain that they feel as though they have a difficult time exhaling due to the pressure being exerted on their airway. Still others complain about the noise that the machine makes. CPAP masks can cause abrasions, skin allergies or other types of skin irritation. These problems can be so uncomfortable for patients that they cannot wear the mask for a full night. In addition, the straps that are used to hold the mask on can cause similar problems. People that have sensitive skin, and who are prone to irritation, are most commonly affected. Patients may have to try several different types and styles of masks before they find one that suits them. Some CPAP users complain that they experience extreme dry mouth when they use the machine. This can be caused by the CPAP blowing dry air into the mouth. It is also possible that the mask is not fitted properly, or that the straps are not holding the mask in place. It could also be because the patient tends to sleep with their mouth open, causing it to become dry and uncomfortable. The most common remedy for this is a heated humidifier attached to the machine. Another common problem that CPAP users report is that they feel as though their stomach is bloated. They may experience higher than normal gas and burping after they use the machine. This is most often caused by a problem with the air pressure setting on the machine. It may take several nights to adjust the machine to the point where the patient feels as though these issues are resolved. Although CPAP machines are the most common form of treatment for sleep apnea, there are certainly other options. One popular new treatment option for sleep apnea that can be performed in-office and offers patients the potential to eliminate the need for a CPAP machine or dental appliance is RFA. To learn more click here. If you would like more information about sleep apnea treatments for you, or a loved one, click on the link or call the number below. We will be happy to discuss the various options available to you. This article was posted in Blog and tagged benefits, cons, CPAP, d.c. metro, issues, maryland, obstructive sleep apnea, options, OSA, pros, sleep, sleep apnea, virginia.